Okay, I admit it I am addicted to this cartoon. Hey! Don't judge that I am in my mid-twenties is still hooked to it like a kindergarten lad. What can I say, a plot with two Einstein-like genius brothers, a sister whose paranoid like nobody I know and friends who supports them even in their most craziest invention. 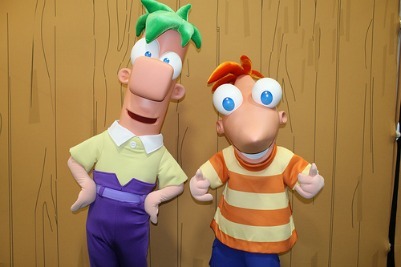 So, yes, I am addicted to Phineas and Ferb. And what more do I want? A Phineas and Ferb drinking game so that I can share this wonderful discovery to my friends! Say what? There's a game like that? Are You Serious? While it seems like I am more like a teenage girl who have seen her crush that day, that's exactly what I blurted out after finding that a friend knows about a drinking game that centers on this great cartoon series. I could not believe that two great things on this world can be combined without any troubles at all. I remember thinking that playing that game while drinking with my friends would totally be one of the highlights of my life, ever! So, as I am full of curiosity and enthusiasm to get this game started, we planned an instant drinking party with our close friends that night. I prepared all my (legally!) downloaded episodes of Phineas and Ferb while my friend volunteered to get the drinks. Words cannot explain how I was feeling that day waiting for the night to come, it was just like a kid waiting for his presents to be delivered by Santa on Christmas Eve. Yes, I think this Phineas and Ferb drinking game is the turning point of me acting as a kid again! take a drink every time Perry the platypus says "uurrrrr"
Whenever Phineas comes up with something to do, it is also the time for the group to down a beer. The gang should gobble up a drink when Isabela says "Whatca Doin'"
Every moment that Candace threatens Phineas and Ferb that she will tell their mom about their escapades, all should drink! For every scene where a character questions Phineas and Ferb about being too young to do a certain project, take a drink. Drink every time the Doofenshmirtz Evil jingle is played. A drink must be consumed every time Doofenshmirtz ends the name of his invention with "-nator"
In rare times that a scene features Ferb talking, everyone should celebrate by drinking. Drink when Phineas and Ferb's mom was not able to catch them red-handed while doing their project. This Phineas and Ferb drinking game really proved that anything can be done if there is a will and a person if full of creativity. While the cartoon may seem to be a harmless thing and could do no wrong, adults can enjoy it in the same way as kids do, but this time they hold beers in their hands instead of milk and cookies.